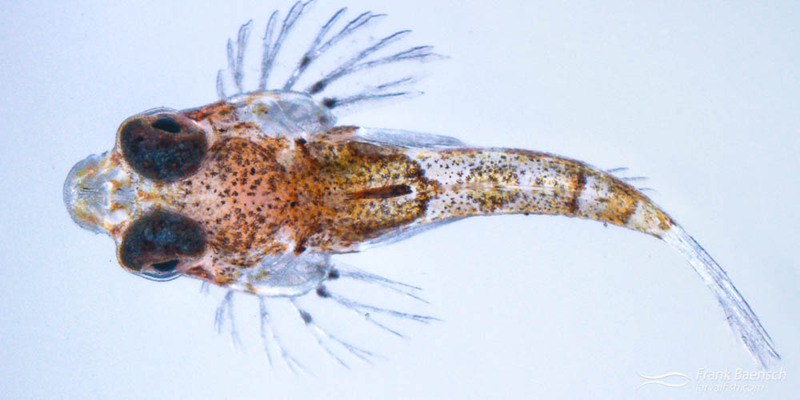 Longtail dragonet (Callionymus decoratus) larvae were raised from wild-spawned eggs at 77-79F on wild copepods. The larval duration was 16 days. First record of Longtail dragonet culture. Dragonets are small to medium (2 – 30 cm), slender, scaleless, slow-moving, benthic reef fishes, comprising 18 genera/186 species. They are found in oceans worldwide but most species inhabit tropical and subtropical seas of the Indo-Pacific up to 200 m living on sand, rubble or mud and feeding on small benthic invertebrates. Most dragonets are well camouflaged and have little economic value but brightly colored species (Synchiropus splendens, S. picturatus and S. ocellatus) are popular aquarium fishes. These species are heavily collected and sporadically available through aquaculture. Juvenile Longtail Dragonet (Callionymus decorates) reared in the laboratory. The endemic longtail dragonet (Callionymus decoratus) is believed to be the most common dragonet species in Hawaii waters. The eggs of this species were regularly collected in egg net tows off the west side of Oahu and juveniles were reared on several occasions. C. decoratus eggs are pelagic, spherical and about 0.6 mm in diameter. Features of the larvae include small size at hatching (1.1-1.2 mm); sharp spinous processes on the fin folds; dense melanophores; heavy reddish pigmentation; rapid development; and their small size (about 6 mm) at settlement. Longtail Dragonet (Callionymus decorates) larvae reared in the laboratory. C. decoratus prove easy to raise on copepods with very high survival rate through settlement. The larvae have a relatively large mouth at first feeding and despite their small size (1.9 mm) are able to feed on small copepod nauplii. The larval period of C. decoratus in culture is about 16 days.